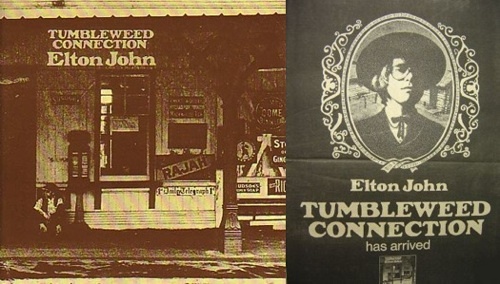 Before the pomp, before the flair, and before the pageantry/self-caricature, there was 1970’s Tumbleweed Connection. No Donald Duck stage costumes or Victorian era wigs to be found here; no, in their stead is a collection of of songs that mark some of Elton John’s most earnest vocals coupled with lyricist Bernie Taupin’s ever thematic songwriting. Lyrically the LP focuses on Taupin’s fascination with the old west; which is made even more interesting as he had allegedly never set on American soil prior to the composition of the lyrics. A testament to Taupin’s songwriting, I have long felt that, lyrically, the core material of the album would make for an excellent series of short stories. Having found a near-mint vinyl copy last weekend, I have since been revisiting the 2008 CD reissue which, among other alternate tracks, demos, etc., houses the original version of “Madman Across The Water,” which later saw its official release on the 1971 album of the same name. Country Comfort is my favorite Elton John song (besides Mona Lisas and Mad Hatters). Gotta dig Ronson’s work on this cut. This is in the water lately. Tom Scharpling (of the Best Show on WFMU fame) has been playing/talking up this album lately. I love this era of Elton John. So good. Love this record. I bought it during a road trip to Colorado and played pretty much nothing else for a thousand miles. Growing up with the lame 80s Elton John on the radio, I could barely believe that the Tumbleweed & Madman E.J. was actually the same guy. I’m ashamed to admit I’d never heard this version of the song before. It blew my mind while I was washing dishes this evening. The brilliant images Taupin created of the American West — grand, far-reaching and intense — were built precisely upon the fact he had no direct experience on American soil. They were all taken from his only knowledge of cowboys and indians: the cinema. The real hero of these great Elton John records, though, is Gus Dudgeon. He glued together the lyrical brilliance of Taupin and the melodic sensibilities of Elton with orchestra arrangements that are, to this day, unequaled. The three of them together, as with the Beatles, were greater than the sum of their parts. They should be ranked at the top of the list of rock and roll originators. I actually went out and bought this today. Good stuff. this was THE LP at our “house” when it hit during my soph. yr. in college . . . w/a decent vinyl rig, the UK orig. pressing is worth seeking out, though it’s pricey. this has always been my favorite Elton John record. i bought the vinyl in the early 70’s and have it tucked away. great record.